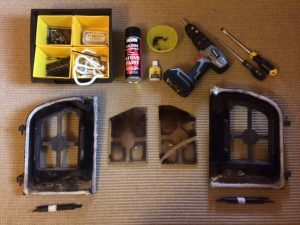 For the latest installment of my blog I wanted to mention an additional service I offer, that of repairs to wood burning stove. This is obviously something best done in the summer months when the stove is not in use, as it involves removing the stove doors and taking them away to be reconditioned. In this way everyone benefits; the customer does not lose the use of their stove during the cold season and I have the time to complete such repairs during the sweeping off-season. I recently reconditioned the doors of a 27 year old Yeoman Devon stove for one of my regular customers. One of the glass windows was broken in two and the glass had become cloudy and stained in both doors; in addition, the ceramic rope seals on both doors had become frayed and ineffectual. Having removed the doors and taken them to my workshop I set about renovating them. I first removed the screws and plates holding the glass to the doors. As is often the case the screws had become welded in place and had to be drilled out. Having removed the old glass and rope seals, I next cleaned the doors of dirt, rust and other material using a wire brush. I then painted the doors using heat resistant stove paint – I used Vitcas high temperature heat resistant paint, as I find it gives the best results. Having obtained the glass I was able to fix it back in the doors and then replace the rope seals using the special heat resistant rope seal cement and not forgetting the heat resistant tape at the end of the seals to stop them fraying. I was then able to re-attend the customers address and re-hang the doors, all within just a few days. Prior to re-hanging the doors I painted the rest of the stove, so once the doors were hung the stove looked as good as if it were new!